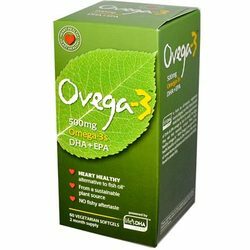 Introducing Ovega-3, an all-vegetarian DHA + EPA Omega-3 supplement from a safe and natural plant source (algae); not fish. With 500 mg of total omega-3s, Ovega-3 provides the same heart healthy benefits of traditional fish oil but without the unpleasant fishy aftertaste associated with some fish oils. Most people think that fish are the original source of DHA and EPA, but it's really the algae they eat that naturally contain these important omega-3s. Ovega-3 has gone directly to the source and bypassed the fish. You can be sure that Ovega-3 is 100% free of PCBs and mercury because it is sourced from plants that are grown outside of the ocean. As one of the highest quality omega-3 supplements available, Ovega-3 is also from a sustainable source and does not deplete the ocean's supply of fish.